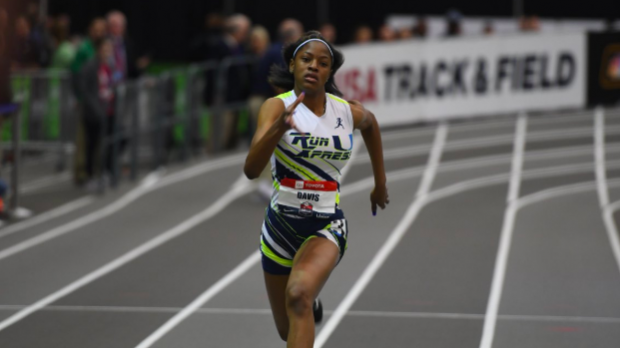 Kayla Davis (Run U Xpress) competed in her first pro field at the USATF Toyota Indoor National Championships in Staten Island, New York. She was set to tackle the 300m where she was the 5th fastest seed coming into the event in a field with post-collegians and professional athletes. Davis came in at NC#2 All-Time only trailing Tamara Clark (High Point Central) for the North Carolina State Record. Clark's record was 37.81 from 2017. Davis already owns the 400m and 500m Indoor State Records. Davis broke Clark's record in the prelims where she would be the 3rd fastest qualifier. The top 8 girls advanced to a two heat final. Davis would be in the faster of the two final sections. She would have Gabby Thomas (New Balance), Candace Hill (ASICS) and Brittany Brown (Unattached) in the final section against her. Davis would be in lane 3 with Thomas and Brown on the outside. Hill did not start. The fastest time in section 1 was 38.28. Brown would edge Thomas in a Meet Record and World Lead of 35.95 to 35.98. Davis would trail them running a new PR of 37.46! Her mark will be a current US#1, NC#1 All-Time, US#3 All-Time and a Freshman High School Record. Davis is also the second fastest u20 athlete in the world over 300 meters right now and she is just 15 years old! Davis only trails Sydney McLaughlin and Francena McCorory in US high school history. McLaughlin's national record is 36.82. Davis would also her first US Medal in her first ever senior competition finishing 3rd overall. Davis' next meet will be New Balance Indoor Nationals where she'll look to take the 200m Indoor State Record as well as improve on her 400m Indoor State Record.